Regular Ed - Special Ed - Gifted Ed! Collections, Projects, Links and More! Numbers! Shapes! Arithmetic! Algebra! Geometry! Biology! Chemistry! Physics! Earth! Space! 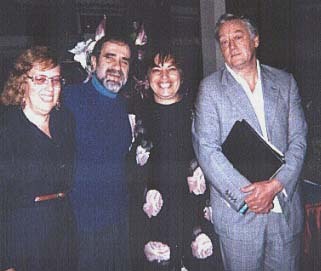 from left: Anne Pemberton, Bob Zenhausern, Sheila Rosenburg, and Tom Holloway in Rochester, NY in 1991. The Mission of Educational Synthesis is to develop a website for students and teachers or parents in the 21st century that provides a widening array of learning resources. Our mission is to carry forward the ideals of individualized education and help insure that students with special needs and limitations will be able to use educational content online. If the needed content cannot be found, we create it! Our mission is to help teachers, parents and students take advantage of the technology of the 21st century. From new pages, to workshops, new projects, and international collaborations, we aim to enlarge the circle of Internet-using students and teachers. Dr. Robert Zenhausern of New York is CEO of the Enabling Support Foundation. Dr. Z maintains the server and oversees all operations. Mrs. Anne Pemberton of Virginia is the creator of Educational Synthesis. Mrs. Pemberton develops instructional resources and creates the web pages. Mrs. Brenda Rion of Virginia is the Consulting Editor of My Own Books and other content on the site. Mr. Randy Cabell of Virginia is the Music Director for My Own Books and other content on the site. Miss Ann Parsons of New York is the Accessibility Consultant on the staff of Educational Synthesis. Dr. Sheila Rosenburg of New York City is a specialist in diagnosis and remediation for children with disabilities and learning difficulties. Mrs. Christine Sonita of Pennsylvania is a consultant in the creation of accessible and accommodated content and the development of a universal curriculum. Mr. William H. Clarke Virginia is a FOLK ARTIST who specializes in rural Virginia scenes. Mr. Clarke's work is exhibited widely in Virginia and beyond. Mr. Clarke has provided art work on these pages. See Mr. Clarke's work at Facebook Folk Artist . you can email him at: clarkecandraw@aol.com. Miss Libby of Michigan contributed a story to My Own Books when she was six. Libby was the student tester of the various My Own books. Master Taylor of Virginia made his first webpage when he was five, and a more sophisticated one when he was thirteen. Taylor was an important tester of many of the Educational Synthesis projects including the Pictionary, and the early random number math worksheets. Page created June 21, 2002. Anne Pemberton. Updated Fri, Jul 27, 2012 . AP.